Lancashire is set to bake once again this Spring Bank Holiday, with county temperatures set to rocket to 23C. And ahead of the weekend travellers have been warned to expect a busy weekend on Lancashire’s roads and rail network with thousands expected to flock to local tourism attractions, such as Blackpool and Windermere in the Lake District, and 4.45 million people nationally planning a journey by car, according to industry experts RAC. 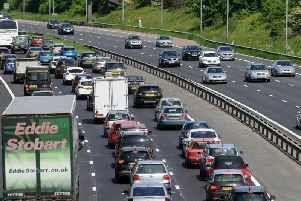 RAC traffic spokesman, Rod Dennis, said: “Motorists planning on covering any significant distance should try to avoid Friday afternoon and evening and get away early on Saturday or Sunday to miss the worst of the jams. Saturday will also see delays for those choosing to travel by train with rail union RMT confirming Northern Rail staff strike action in relation ongoing disputes over guards and rail safety. Richard Allan, Northern’s Deputy Manager Director, said the decision to strike during the Bank Holiday weekend is “disappointing”. And while temperatures are to remain at a high, the Met Office said that the record for the hottest Bank Holiday was not likely to be beaten this weekend. A spokesman said: “The average temperature for this time of year is 15C (59F). A risk of thunderstorms in the build up to bank holiday Monday is expected, but the north west is likely to miss out.